In November 2009, the landscape of gaming in Ohio changed dramatically. After numerous defeats, Ohioans voted to approve a constitutional amendment permitting casino style gaming in four locations within the state: Cincinnati, Cleveland, Columbus, and Toledo. The four casinos are permitted up to 5,000 slot machines and are allowed to include the types of slot machine and table game wagering authorized (presently and in the future) in any of the neighboring states of Indiana, Michigan, Pennsylvania, and West Virginia. Also in 2009, then Ohio Governor Ted Strickland enacted an executive order to allow 2,500 video lottery terminals (VLTs) at each of the state’s seven racetracks. However, the introduction of VLTs to the Ohio racetracks met with a number of legal challenges as to the constitutionality of the action. The legal challenges were not resolved until May 2012. Unlike the four casinos that are governed by the Ohio Casino Control Commission, the seven racetracks or racinos are governed by the Ohio Lottery Commission. The Ohio Lottery Commission is responsible for rules and licensing of VLTs at horse racing tracks, while the Ohio State Racing Commission monitors the horse racing operations. Unlike the casinos, the racinos are not permitted to operate table game wagering. This article compares the performance of casino slot machines and racino VLTs and gives an overview of the Ohio gaming industry. Due to the relatively brief history of casino gaming in Ohio, casinos and racinos are still in the early stages of development. The first casino to open was the Horseshoe Casino Cleveland on May 14, 2012, followed later that month by the Hollywood Casino Toledo. The first racino to open was Scioto Downs in suburban Columbus on June 1, 2012. The opening dates and number of slot machines/VLTs for the casinos and racinos in Ohio are set forth in the following table. Since the start of gaming operations, the opening of Horseshoe Casino Cleveland on May 14, 2012, the growth of gaming has been rapid. The number of gaming units increased 98% in fiscal year 2013 as all casinos in the state began operations as did one additional racino, Thistledown Racino. In fiscal year 2014, three more racinos – Miami Valley Gaming, Hard Rock Rocksino Northfield Park, and Belterra Park Gaming & Entertainment Center – began operations that increased the number of machines by 41%. In fiscal year 2015, the remaining two racinos – Hollywood Gaming Dayton Raceway and Hollywood Gaming at Mahoning Valley Race Course – began operations, increasing the number of gaming units by 12%. 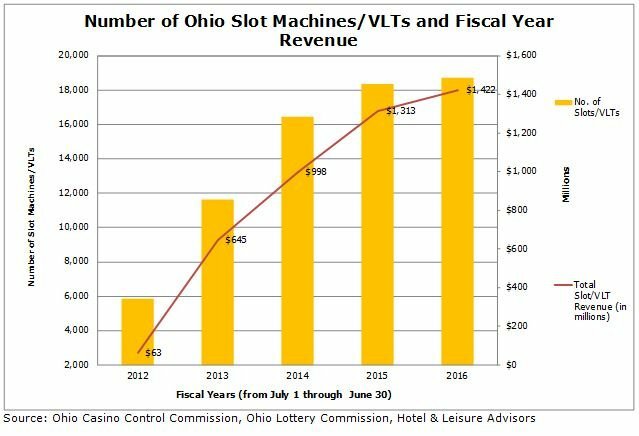 In 2016, the first full year of operation for all gaming venues, over 18,700 slot machines/VLTs are in operation in Ohio. 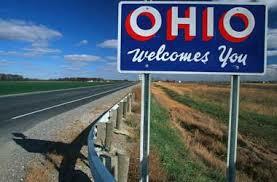 The Ohio casinos and racinos are not yet destinations and lack drawing power from distant populations. Only the JACK Cleveland Casino has direct connectivity to a hotel, the Ritz-Carlton Cleveland, while most of the other gaming operations partner with nearby hotels for overnight guests. The Ohio gaming operations compete for customers largely within their immediate markets or nearby state venues in Pennsylvania, West Virginia, Indiana, and Michigan. Casino operations have a competitive advantage since they are permitted to offer table games while the racinos are limited to VLTs. Thus, the Ohio casinos have a monopoly in the offering of table games in their respective communities, affording them the opportunity to expand their target markets. The performance of Ohio gaming operations can be measured by both the gross slot machine/VLT revenue and by the amount of revenue per machine. Gross slot machine/VLT revenue or “win” equals the amount wagered less the amount paid out as winnings. With the wider availability of gaming opportunities, the overall growth in gaming revenue has followed. The following chart illustrates the subsequent growth in gaming revenue since 2012. Fiscal year 2016 represented the first year in which all casinos and racinos in Ohio have been in operation for a full year. The growth in gaming revenue has corresponded directly with increases in additional venues and gaming units, indicating that the demand for gaming in Ohio as a whole has potential for growth. Another method of forecasting gaming revenues is predicated on wins per machine per day. This method looks at the dilution of revenue on a per machine basis. The following chart illustrates the gaming revenue per machine from both casinos and racinos in Ohio as the inventory of gaming venues increased. JACK Cleveland Casino (formerly Horseshoe Casino Cleveland), Hollywood Casino Toledo, and Eldorado Gaming Scioto Downs Racino were open for a very short time in fiscal year 2012. 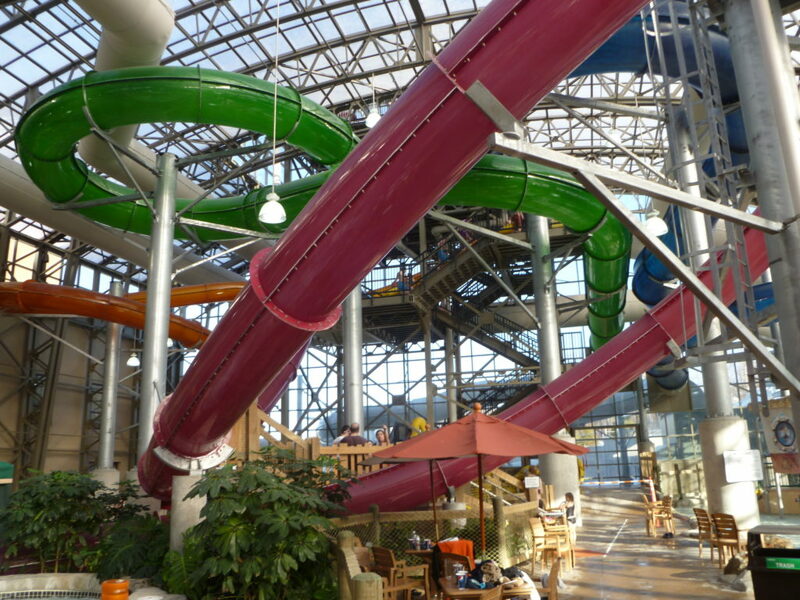 Although the three properties were open for less than two months of operation, they achieved strong revenue per machine per day. 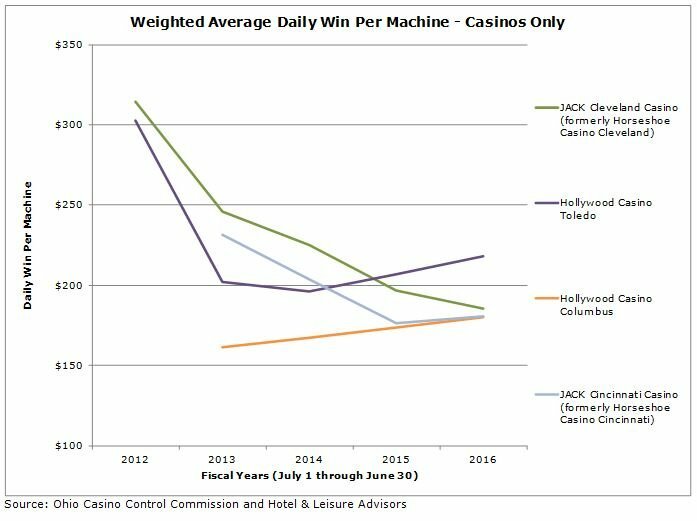 However, with the opening of the Hollywood Casino Columbus, JACK Cincinnati Casino (formerly Horseshoe Casino Cincinnati), and JACK Thistledown Racino, the wins per machine per day declined from $285 per machine in the stub year of 2012 to $202 per machine in fiscal year 2013. As the number of gaming venues and available gaming machines has increased, the revenue per machine has remained relatively flat for the state overall, increasing only slightly in 2016 to $208 per machine. Although the wins per machine per day have been steady statewide since fiscal year 2013, that is not true on a property-by-property basis. Casino revenue per machine has declined sharply as shown in the following chart. Three of the four casinos declined on a win-per-machine basis following their first full year of operation. Only Hollywood Casino Columbus has improved performance year over year on a per machine basis. Casinos in Toledo and Cincinnati reversed the decline on a per machine basis in 2016, while JACK Cleveland Casino experienced performance decline. 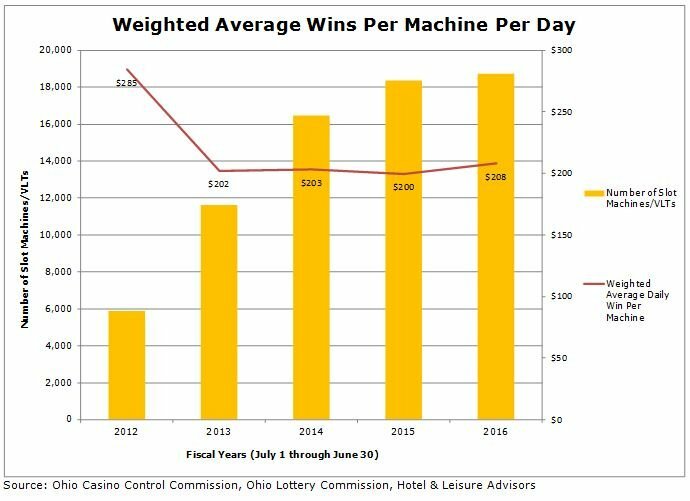 In 2016, the weighted average of daily win per machine for all Ohio casinos was $191. Ohio racinos have performed better than their casino counterparts on a daily win-per-machine basis as shown in the following chart. 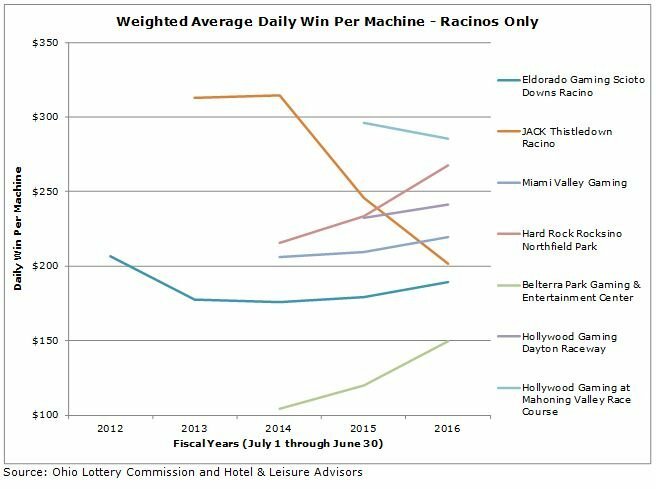 Since fiscal year 2014, five of the seven racinos have shown an improvement in average daily win per machine. While Hollywood Gaming at Mahoning Valley Race Course, which opened in fiscal year 2015, declined in its first full year of operation in fiscal year 2016, it achieved the highest average daily win per machine of both racinos and casinos. Only JACK Thistledown Racino has experienced a sharp decline in performance from 2014 to 2016 primarily due to expansion in 2015 that concluded in 2016. Overall in 2016, the weighted average daily win per machine for all the Ohio racinos was $221, approximately $30 higher than their casino counterparts. The gaming industry in Ohio is in its infancy with the last of the gaming operations having been open for a little over one year. The early indications are that the industry overall within the state is stabilizing with some regions pointing toward improving performance. All of the venues in central Ohio, southwest Ohio, and Toledo showed improved performance on a win-per-machine basis in 2016. Only the venues in Northeast Ohio struggled to establish footing, although Hard Rock Rocksino Northfield Park has shown positive growth each year of operation. The gaming venues that make an effort to increase market penetration and grow gaming revenues by expanding other operational activities and leisure options are expected to experience the greatest success. For example, Hard Rock Rocksino Northfield Park offers a large entertainment component with live entertainment and the ability to host banquets and events. The gaming venue is also considering adding a new hotel. Eldorado Resorts Inc. has entered into a joint venture to construct a Hampton Inn & Suites at Eldorado Gaming Scioto Downs Racino. The 118-unit hotel will be adjacent to the Brew Brothers restaurant and will contain 4,000 square feet of meeting space, fitness center, and indoor pool. Scioto Downs will be the only racino in Ohio with its own hotel to accommodate overnight guests. NAI Harmon Group has proposed the development of an entertainment district across the street from the Hollywood Casino Toledo. The proposal includes a 150-room hotel with conference space and approximately 100,000 square feet of retail and restaurant space. While Penn National Gaming, which owns the casino, is not a participant in the project, they have been supportive of the concept which was announced in the casino’s H Lounge. Four years time is too brief to determine the long term coexistence of casino slot machines and racino VLTs. Given the market has begun to stabilize after the opening of Ohio’s four casinos, it will be interesting to see what types of changes are ahead for the industry in Ohio as properties continue to compete for market share in this still new gaming industry. As properties are considering expanding with hotels, banquet space, and other leisure options, it’s clear the gaming industry will have a significant impact on hospitality in Ohio going forward.